This is my last Clear Dollar Stamps post as June Guest Designer. I’d like to thank both Lori and Laurie of CDS for their faith in me, the great stamps and warm welcome! Thanks to all of the Team Members too who came by to leave lovely comments on my cards. I had a great time despite how insane June turned out for me overall and I hope you think I gave your stamps a good workout! I just love this rose image. It is so delicate and lovely! And you can kind of see where to shade with this stamp. For me, the more petals, the easier it is to shade. For someone new to stamping, each petal can be coloured darker away from the light and lighter towards the light source. After some practice, you can add shading within each petal, at least the ones large enough to do so. I’m afraid my colouring looks too washed out here. I used reinkers to watercolour with for the first time! It takes several layers and an almost dry brush to colour like this. You can click to get a larger photo. It is so much prettier IRL. I can’t wait to take my photography course. We tried resetting the white balance on my camera as all my previous photos were slightly sepia toned and now it is a bit too blue-grey. I will get it right eventually! Back to the card!! hee hee!! I embossed my image to make colouring even easier. It is much harder to accidentally slop colour on a neighbouring petal and sure looks pretty too! The shine actually showed up this time and so did the rhinestones in the corners of the card! The bow was made with the Bow Easy and I threaded another ribbon through the back so it appears to be tied from pieces of ribbon coming from each side of the card. The only drawback to doing it this way is that the bow skews slightly to one side. I promise, it is even! I used the text stamp in the set for the background. 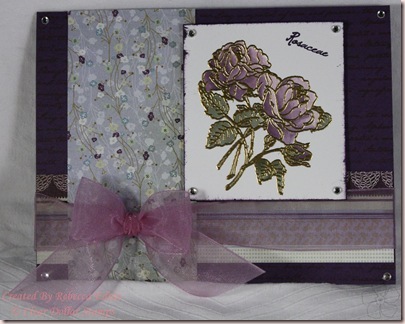 Paper: Wisteria-Basic Grey, eggplant, white CS-SU!